I’ve been thinking about making my own dulce de leche since we went to South America last year. Especially when I found out it was also called milk jam - I love that. Plus caramel on toast for breakfast was pretty much the best thing ever. It takes a while to whip up a batch, with a lot of stirring involved, but the homemade stuff is pretty awesome. It's rich and creamy with all the nice earthiness from the saffron. The saffron is absolutely not traditional so feel free to leave it out or add a vanilla pod instead if you prefer. This is a good thing to tackle when you’re cooking something else and in the kitchen for an hour or so, as you’ll need to watch over it, but for the first 30 minutes you’ll only need to stir every 5-10 minutes. First add saffron to a small amount of boiling water (roughly 2 tbsp) and let it steep. 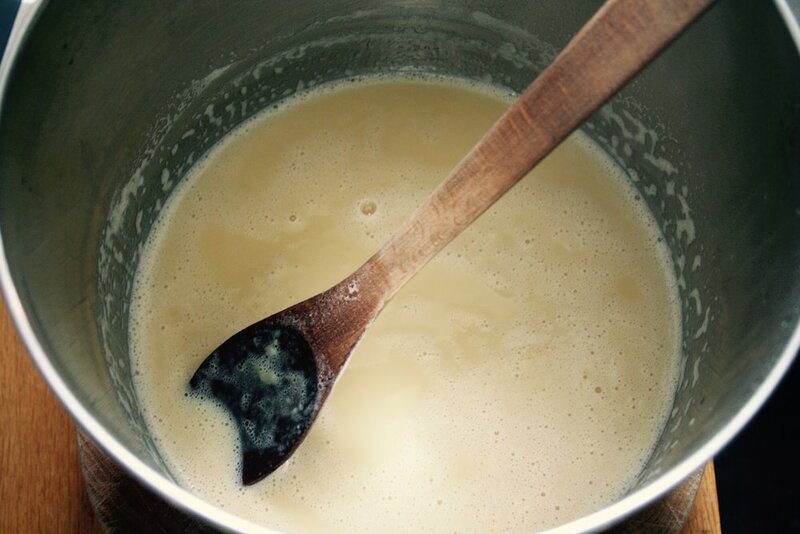 Add milk and sugar to a medium sized saucepan and bring to a simmer, stirring until the sugar dissolves. Find the right temperature – the milk should be rapidly simmering but not bubbling over – and leave the milk to reduce by about 2/3rds. All up this will take about an hour. For the first 30 minutes I stirred it every 10 minutes to make sure nothing was sticking to the bottom. For the next 20 minutes, while it started turning a light caramel colour, I stirred every five minutes until the milk really started thickening and turning a darker caramel colour. For the last 10-15 minutes you’ll pretty much have to stand and stir. The milk will reduce right down, become thick and sticky. I used a whisk for the last stage as it started to look a bit lumpy. When you’re happy with the colour and consistency stir in the saffron for a couple of minutes then take off the heat. Pour into jars immediately. When the dulce de leche cools it becomes the consistency of peanut butter. It’s perfect to spread on toast with banana and nuts for breakfast. If you’d like to drizzle it over something, heat it back up by placing the jar in a bowl of boiling water and giving it a good stir. I had the genius idea of making ice cream cones for my nieces and nephews. Unfortunately though when you try to drizzle dulce de leche on ice cream, it cools down rapidly and forms what I can only describe as a blob, and then slides right off the ice cream and onto the ground. After several hundred attempts at this, and not wanting to let the ice cream cone dream die, I gave up and made a deconstructed dulce de leche, vanilla and sesame ice cream instead. I highly recommend toasting sesame seeds and adding it to whatever you end up doing with this very decadent condiment, it’s nutty and delicious and adds a great crunch.